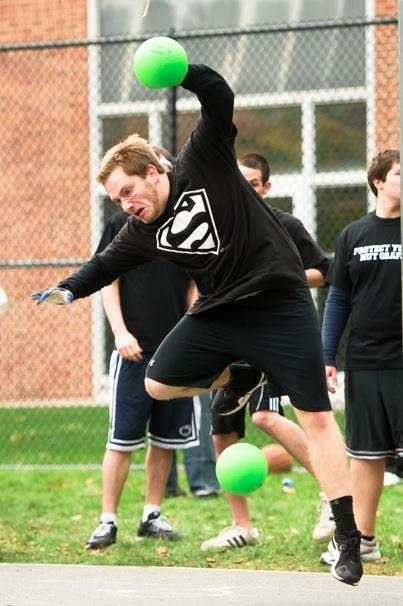 Phroth plays Valley Magazine in the dodgeball tournament. Photo by Andy Colwell/andycolwell.com. Phroth rallies the troops. Photo by Andy Colwell/andycolwell.com. 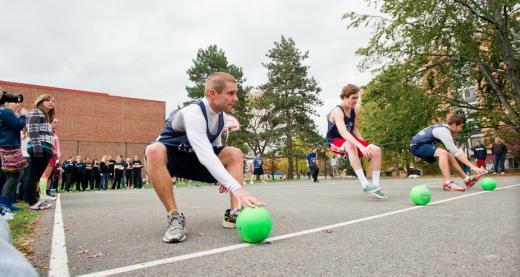 From left to right, John Tecce, Ryan Kristobak and Dave Cole, all of Onward State, rush at the start of a game. Photo by Andy Colwell/andycolwell.com. Mike Cottone, a Collegian staff member, was among the highest-profile players at the tournament. Photo by Andy Colwell/andycolwell.com. So you think you know your people, huh? OK, you say: Some in the tribe are a few bananas shy of a full bunch. Fair enough. And there's always the wingnut who may or may not be doing unspeakable things to the office coffeepot. It happens. By and large, though, your people are good people, right? Right. You run with a good crowd. Otherwise, it wouldn't be your crowd. But let me tell you something: You don't know your people -- your own chosen tribe -- until you've seen them play dodgeball. See, I thought I knew my people. We'll call them, in very general terms, the Penn State media people. They report; they write; they edit. They shoot photos and videos, design pages, sell advertising. They inform town and gown, answer your questions, keep you entertained, fill your spare time. They also, it turns out, are a repressed goon squad of violent tendencies. They're a blood-happy mob willing to pry your eyes out with a dirty clothespin, insult your mother and pummel your face. Too poor to afford tranquility-inducing meds (Hey -- these aren't future Smeal alumni, OK? ), they'll laugh hysterically when you fall to the cold ground -- and then smack you again, perhaps in the head. OK -- to be fair, maybe not you specifically, you beautiful reader. Truly, they (probably) adore and revere you. They just detest one another. Or at least their rival organizations, anyway. Online chatter about the tourney idea began circulating some months back. But in the past several weeks, the pitch jumped headlong into reality. By the time Saturday afternoon rolled around, the journos had prepared for days -- perhaps weeks -- largely by talking trash on Twitter and Facebook. For the Collegian and Onward State especially, it was to be a physical Airing of Grievances, in supreme Festivus fashion. No one put it quite that way, of course, but that was the clear undercurrent. The pain train was fueled and prepared for a non-stop express trip. After all, tensions between the newspaper and the blog have been building for several years. You have, on one side, the Collegian: the indomitable, 125-year-old powerhouse of student journalism, steeped in tradition and service. And then you have the much-watched, edgy Onward State: the relative upstart that's claimed national attention for its conversational, highly tech-driven approach to information and commentary. No one with any common sense would volunteer to get between those two in a fight. So I did: I offered to be the referee. Then the daggers came out. 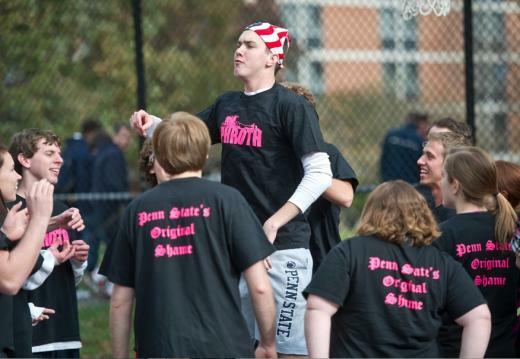 The Collegian-Onward State match-ups turned almost war-like. Their lieutenants contested anything marginally questionable. In? Out? Your momma? With the championship title and bragging rights on the line, everything was reason to scream. A couple fisticuffs nearly broke out. Ultimately, it came down to one game and -- if you ask some players -- one call. The Collegian had one player left on the court: Advertising Manager Mike Cottone. Onward State had a few left on its side. Cottone apparently stepped over the middle line. But your intrepid ref missed the apparent violation because parties from both sides had been distracting his attention, tensions boiling over. By how much did Cottone breach the line? I didn't know. Had someone somehow interfered? Why did he breach the line? Was it deliberate? Or had he slipped on the excessive tree debris littering that corner of the court? Had that been the case, how could I have rightfully declared him in violation? I let Cottone stay in. He went on to win it all for the Collegian. Onward State took second. I'm now a beloved folk hero. And a despised, disgusting villain worthy of flaming excrement. But at least no one insulted my momma. 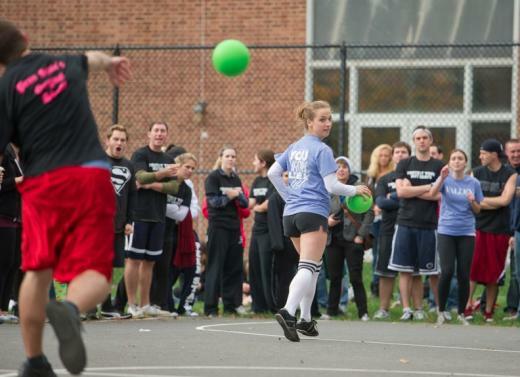 Preliminary conversation about a spring dodgeball tourney has already begun. Phroth -- which won an award for sportsmanship Saturday -- better come back to bring the peace. Because when media play, media play for blood. 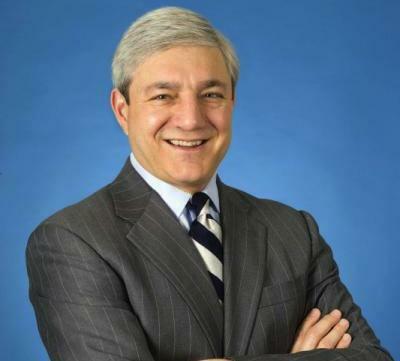 Penn State enrollment at University Park was nearly 39,600 when university President Graham Spanier took office in 1995, official data show. That figure, officially, is now 45,194, having ticked up steadily, according to the Penn State website. But the university has no plans to grow University Park enrollment any more, Spanier said Friday.